CBS: The night’s NCAA TOURNAMENT broadcast games were at a preliminary 2.2/2.8, more than doubling anything on the other networks. CW: THE ORIGINALS had a 0.1 bump to 0.4, and REIGN remained at 0.2. NBC: The next-to-last GRIMM stayed at 0.8, and DATELINE was up 0.2 to 1.0. FOX: After a 0.5 rerun of ROSEWOOD, SLEEPY HOLLOW gained 0.1 to 0.5. 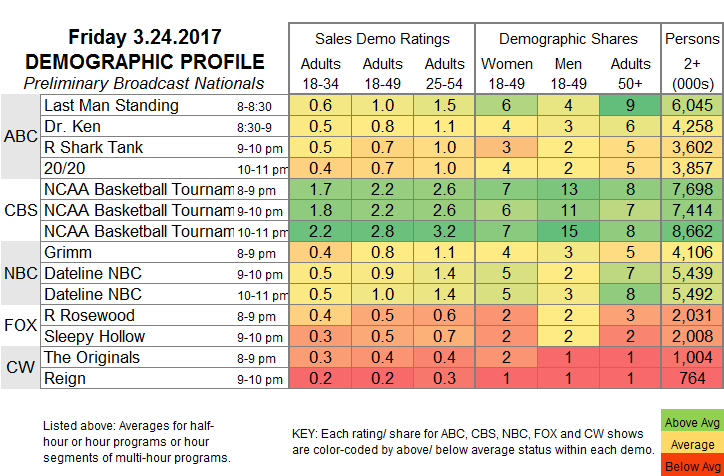 ABC: LAST MAN STANDING (1.0) and DR KEN (0.8) were steady. After a 0.7 rerun SHARK TANK, 20/20 was at 0.7. Now that the NCAA TOURNAMENT has moved to the Elite 8, both of today’s games belong to TBS, with CBS taking over on Sunday.